UNIFIED MIDDLEWEIGHT CHAMPION Gennady Golovkin showed no mercy against challenger Dominic Wade, retaining his title thanks to a devastating second-round knockout in Los Angeles. American Wade was no match for the unbeaten Golovkin, who earned his 22nd consecutive knockout in the second round at The Forum on Saturday. 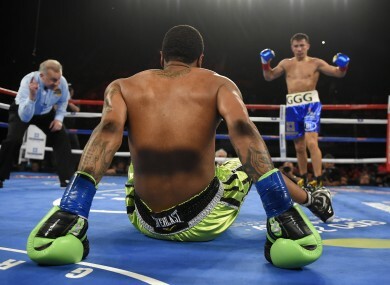 Golovkin floored Wade twice in the second round, four times in total, the killer blow coming in the form of a powerful right hand as the Kazakh boxer improved to 35-0 with his 16th successful title defence. The 34-year-old – boasting 32 career knockouts – then quickly turned his attention to WBC champion Saul ‘Canelo’ Alvarez, who is preparing for his showdown with Amir Khan on May 7. “I feel great. I’m here now, and I’m here to stay. I’m not going anywhere,” Golovkin said. “Give me my belt, give me my belt! Let’s fight. Email “Relentless Golovkin defends title with devastating knockout - his 22nd in a row ”. Feedback on “Relentless Golovkin defends title with devastating knockout - his 22nd in a row ”.